Happy gotcha day, Ned and Gingee! Today is two years exactly since Ned and Gingee’s “gotcha day”! In other words, it’s two years since we adopted them and they came home to live with us. It’s hard to believe, in a way, how fast these two years have gone. It feels like you’ve been part of our family forever. But it also feels like only yesterday that I felt so apprehensive as I waited for a response to find out if you’d be able to come and live with us. It’s funny how time works like that! I can honestly say that you’ve changed our lives for the better. You made us a family, rather than just a couple. Driving home with you in the car for the first time felt much how I imagine it will be when we bring your human sibling home in a few weeks. I knew everything had changed, but I had no comprehension of just how much. We didn’t know quite what we were doing at first, but the four (now five, soon to be six) of us have figured it out together. Ned, you’ve caused us so much worry that it’s unbelievable. So many times we’ve thought we might lose you, but you keep on persevering, and now you’re so strong. You are an inspiration to me, little man. How can you have gone through so much pain and discomfort and come out the other end still so happy and trusting? The last time you had your vaccinations, you were purring as the vet was putting the needle in you! You’re an unusual little bunny. You love car rides, being brushed with a wet comb, all kinds of things that rabbits aren’t supposed to. Maybe you’re part kitten or puppy. You’ve still got an adorable little baby face, and I know that it causes problems for your health, but I think you are one of the most beautiful creatures I’ve ever seen. You’re much tinier than you should be, but your intense personality more than makes up for it. We know you can’t hear us very well, but we also know that you know how much we love you. I love how you climb up onto my lap when I’m feeling sad, and how you enjoy playing with our hands. You’re the tiniest, greediest little thing, and I know that’s probably my fault because I spoil you. I just love to see you so excited! You are such a good brother to Barbara, and it’s so nice to see you take care of her. I didn’t know it was possible to love anyone so much until you came into my life. Gingee, you are the bravest and cleverest rabbit in the world. You know that you’re the best therapy bunny anyone could ever want, don’t you? You’re definitely the one in charge, despite what Barbara might think. You’re so good at trying to take care of her and Ned, and I’m so proud of you for persisting in grooming their eyes when they need it. I can’t believe how clever you are. You’ve eaten more cables than I can count, broken out of so many cages, and understand so many words. You’ve even learnt to train Ned – although we really don’t mind if he goes on the stairs! I know you love me, Gingee, even if your daddy is your favourite person in the whole world. I’m so pleased that the two of you get on again. Seeing you interact is one of my favourite things in the world, because for so long I thought you’d hate each other forever. I know you didn’t enjoy us persevering and repeatedly trying to bond you, but I think you’re happy about it now, aren’t you? You love cuddling each other these days! I can’t believe it’s been two years since your gotcha day, and I can’t wait to have many more years of adventures with you both. Hello friends. It’s me, Barbara Rabbit, here again. Catch up on my older posts here! So, I’ve been thinking. I would like a rabbit pet. Not a pet rabbit – I’m a pet rabbit myself. I would like a pet for myself. I know I’m getting a baby human soon and that will be lovely. But I think there are lots of other animals out there that I would enjoy living with as well. I’ve been trying to think over the advantages to each one and work out which would be best for me. Of course, I doubt my humans will let me have any kind of new animal. They can be so unreasonable at times. I mean, it would only be a bit of extra work for them. They wouldn’t have to do any of the training. My brother Gingee has learnt to do animal training. He copies what the humans do and he’s taught Ned to keep away from the stairs by doing a little growl and then moving him. It’s very clever. So honestly, all it would really be would be a bit more cleaning and perhaps some more food and maybe transporting them on a very occasional vet visit. Hardly anything at all, really. They can fly, you know. I’d be able to train it to fetch me the treats that my parents insist on keeping on high shelves that I can’t reach. I’ve tried to get Ned and Gingee to do some sort of obstacle course run onto the top of the chest of drawers where the fenugreek cookies live, but they just keep on looking at me as though I’m mad. I can’t imagine why. As young rabbits (they’re only two), I think they should be taking plenty of exercise to keep supple and not develop arthritis like I have. Yes, there’s a bit of risk, but boys are meant to enjoy that! 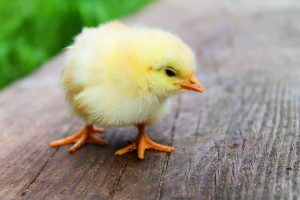 Also, chicks are really fluffy, so it would be a bit like having another rabbit around. We’d take turns to groom it. And I bet the beak would be useful at times – we could train it to attack if needed! I’m only thinking of a small monkey. I wouldn’t want an ape or a gorilla or anything huge like that. But a tiny little monkey that I could train to open doors and food containers for me would be really useful. And I bet they’d be absolutely brilliant at grooming! They’d probably also be quite good at giving cuddles if I needed them when my humans weren’t available. At times, I do really like cuddles. However, I think a monkey might be rendered irrelevant by my upcoming human baby. She’ll be able to perform most of the monkey’s tasks, I think. I could sit on its back and be a lot faster than my brothers when it ran. Did you know that rabbits and horses are actually fairly similar? 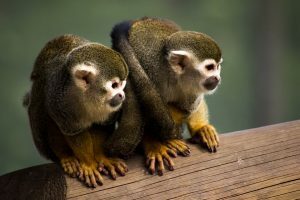 Yes, I know we don’t look at all alike, but our digestive systems are pretty much the same, and we could share our hay. 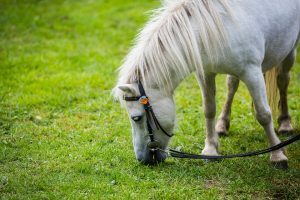 I’ve even heard that if you can’t find a rabbit specialist vet, you should try and make sure your parents take you to an equine vet if you need some sort of specialist treatment, as they’re more likely to know what to do on you than a cat and dog vet. Horses and ponies even binky like us bunnies do! Yes, I have Ned and he’s pretty much like a little goat. But think about it: goats are pretty similar to us rabbits. They’re determined and feisty and furry and I hear they have a great sense of humour. And they’re really destructive and sometimes I’d like some help in trying to dig up the carpet or tear up all the newspaper in the world. 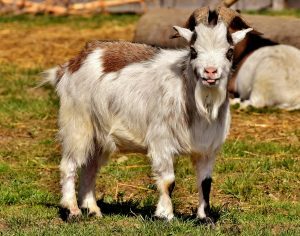 A goat could be a really good asset to me there! The horns do scare me a bit though. Well, those are my ideas, anyway. Does anybun else have any good suggestions? Until next time, my long-eared friends! Friday was my 30th birthday. It’s strange, I’ve never really been one to get too upset about birthdays, but I did feel rather wobbly on Thursday night and Friday morning. I could always put it down to pregnancy hormones, I suppose, but quite apart from that, I think there’s something about 30 that does make you think. 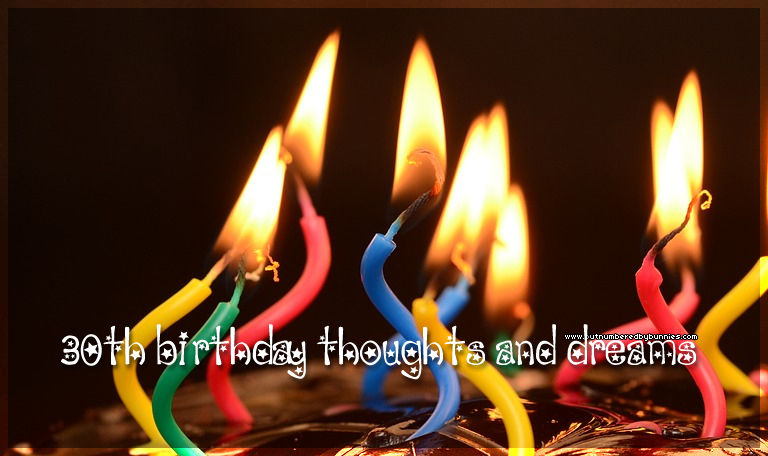 It’s the kind of age that you think about and have ideas of where you’d like to be. I mean, obviously this varies from year to year. Last week, I was fairly sure I’d be in pretty much the position I was in on my 30th. But when I was younger, I had all these ideas of how life was going to work out. Some of them have happened and some haven’t. I’d have had children by now. I’m working on this one, obviously. And technically I do have a child, just not a born one yet. I’m not exactly upset about this, because I know why we didn’t try for a baby earlier. And if any earlier baby wouldn’t have been this one. And I love this particular baby. I’d have a more successful career – or be independently wealthy and not need to work. Okay, so the “independently wealthy” idea was always a long shot. I’m not too sure how I pictured it happening. Maybe a lottery win? Or perhaps I was going to write an amazing novel and be a fabulously published author by now. Either way, it didn’t happen. I have a job I quite enjoy, colleagues I get on with, we have enough money to get by, and while I do have some career hopes and dreams for the future, I suppose I’m averagely content with where I am on this one. It would be nice to have a bit more spare cash, but maybe that’ll come in the future. I’d be calmer. Small things still irritate me. Bad drivers. Birds singing and waking me up. Whistling. That sort of thing. I really hoped I’d be over this by now, because it certainly doesn’t make me happy! I also thought I’d be over a lot of my fears – instead, I seem to be picking up new ones. 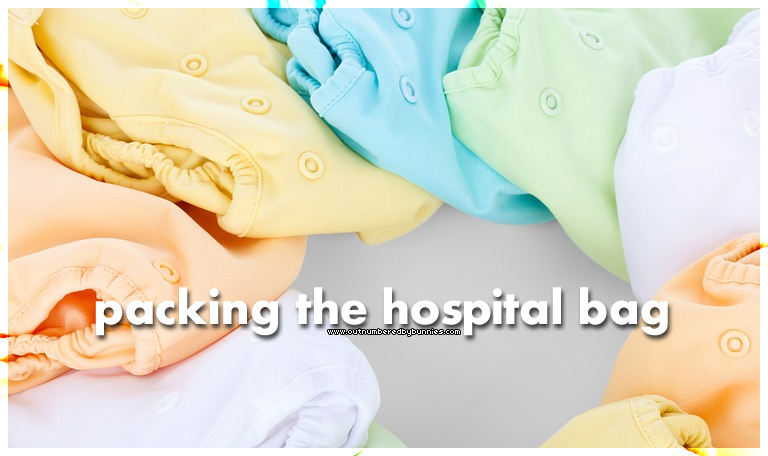 Developing a fear of needles during pregnancy is a great idea, brain. I’d have more friends. At school I had a fairly large crowd of friends and we thought we’d be there forever. (Spoiler alert: doesn’t always happen.) I found some more amazing friends at uni, and to be fair, we do keep in touch very well, considering we live all across the country. But I don’t have many local friends that I can just call up for a chat, or anyone who’ll pop in for a visit. I mainly have my husband and my parents. Also, my husband is some sort of friend-making genius, which does make me feel worse about it. I’d be more generally “together”. It’s hard to put exactly what I mean into words. I thought I’d be able to do things like easily keep on top of the laundry, fold a fitted sheet, have a clean house all the time, not feel stressed when parking the car, that sort of thing. But I’ve come to realise that maybe all of the adults who looked like they had it together when I was younger were all pretending. We’re all just putting on an act, aren’t we? But in general, it’s best to focus on the good. And there is a lot of good in my life. Married my best friend. Yes, he drives me crazy from time to time, but he’s generally a rather nice chap. Living with anyone would have been an adjustment, let alone starting a family and dealing with all of the general crap that goes on in daily life, but there’s no one I’d rather have tackled it with than him. We are about to embark on a new adventure and I’m nervous but excited. We can do this. Bought a house. We chose to live in an area with a very low cost of living and low house prices. It might not be the most glamorous of towns but we like it. We paid our deposit through an inheritance and my living at home with my parents and saving like mad until I was 27. But we can see ourselves staying here for the forseeable future. We love our house. I have a job. I know this sort of falls under both categories. But I am employed and I do quite enjoy what I do. I’ve been there for over six years at this point so it can’t be too bad, I suppose! Passed my driving test. Learning to drive scared me, but I did it. I’ve just passed the sixth anniversary of passing my test, and driving has given me a lot of freedom. I have three beautiful rabbits. And we’ve nursed them through some serious illnesses, and quite honestly kept them alive when other people might not have persevered. Ned in particular. I look at them and feel proud. My body has grown and carried a baby nearly to term. We’re nearly there – 35 weeks! I’m proud of how my body has done this. So, a couple of days after my 30th birthday, and having experienced a few days of actually being the scary age, I feel okay about it. On my actual birthday, my husband brought me breakfast in bed, and then we played a nice competitive game of Scrabble before getting on with the day. I spent the day with my mum, where we developed an unhealthy addiction to watching Yummy Mummies on ITV – seriously, we went through three episodes in one afternoon! Then my husband and I went to my favourite restaurant that evening to celebrate, and ate ourselves absolutely silly. Probably our last chance for a night out before baby! And we need to save the pennies now. But it was nice to celebrate and spend an evening together, even if it did end with us both feeling uncomfortably full! And then I rounded off the day with rabbit cuddles and a long candlelit bath, just me and baby and a book. It was all very low-key and relaxing, which is what I need right now that I’m approximately 7536 weeks pregnant! To be honest, it feels absolutely no different to being 29. I’m not sure what my wobble was about! Have you felt like this over a milestone birthday? What happened? I admit to being pretty clueless when we adopted Ned and Gingee. I’d had a rabbit growing up, so I thought I knew what I was doing. Then it turned out Ned was pretty sick, and I started looking for online rabbit resources. There is a lot more information out there than there used to be. 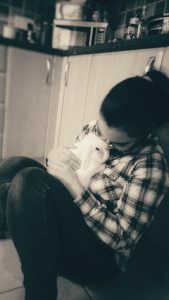 Back in the 90s, when I had my first lovely bunny, everything seemed very simple. But then again, rabbits didn’t live very long back then either. Everyone was amazed that I had a bunny who was 11! Even nowadays, a lot of “civilians” don’t know much about the proper care of a rabbit. 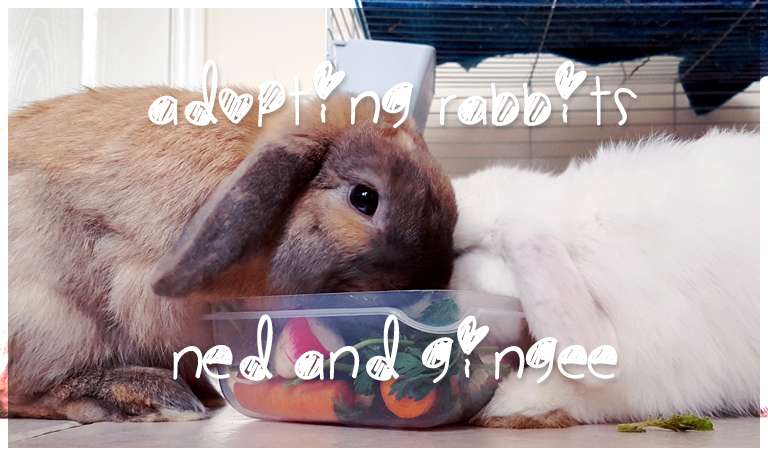 Fortunately, I’ve found loads of online rabbit resources that have helped us bring Ned back from the brink, keep Gingee healthy, and be the best owners that Barbara needs. I’ve divided my list into two sections: one is “static” information, and the other is helpful groups that you can join. I find it can actually be helpful to have someone to talk to, and I’m a part of a few Facebook groups. The Rabbit Welfare Association and Fund (RWAF): The UK’s largest rabbit association. 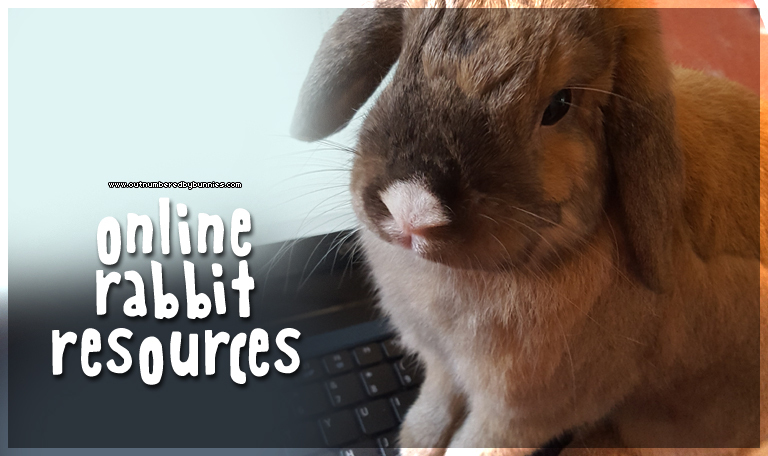 They have some brilliant information on what to do in various bunny health situations, and their rabbit-friendly vet list is one of the best you’ll find in the UK. Binkybunny.com: This site has some great information on topics such as litter training, bunny-proofing, healthy diet, etc. They’re a US site so some of their information about costs isn’t quite accurate for me, but I usually find myself here if I’m curious about whether a new food is okay. There’s also a forum, which I’ve never participated in but have read fairly extensively. Over the years they’ve answered most questions I’ve had, without my even having to ask! The House Rabbit Society: Lots of good resources on difference aspects of raising a house rabbit, and also plenty of lovely pictures. If you’re in the US, they also have a good list of vets who will treat rabbits. 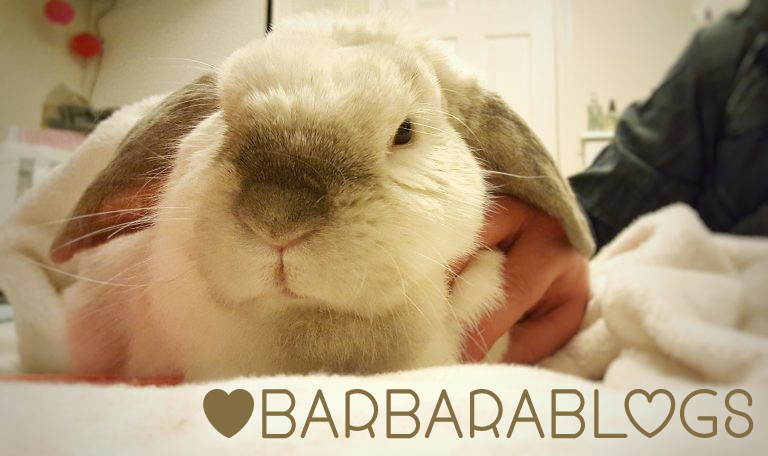 Rabbit Owners Community: This is, hands down, my favourite online rabbit resource. 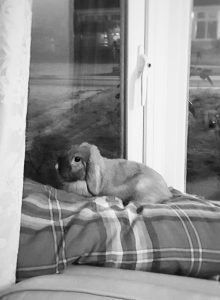 There are members from all over the world, which means that you get a great variety of opinions, and there are a lot of very wise rabbit owners there. If you’re doing something that could hurt your bunny or that isn’t best practice, you’ll be told. If you just want to share cute pictures of your rabbit, they’re very very welcome! They have some great resources in their downloadable files as well, some great guides to bonding, vets, etc. Definitely worth joining this one! UK Rabbit Group: I’d recommend that everyone joins a local rabbit Facebook or similar group, if they can. While obviously we all like to think we’re prepared in terms of emergency vets, last-minute food questions, etc., we all know that problems crop up from time to time. And it’s nice to have the possibility of local people to ask. I’m sure I’ve missed some really good ones – are there any others you’d recommend?